As faithful as a Labrador, there has never been anything like the Aussie ute and there never will be again. Once considered just a tool of the trade, the humble ute has evolved into a sports luxury vehicle and a status symbol among tradies. 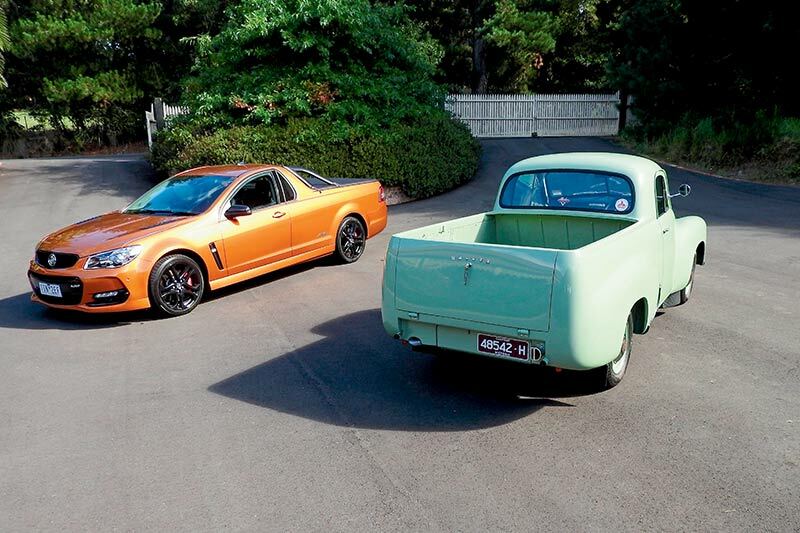 In our ‘Salute the Ute’ we’ve bookended the first and last models to leave the Holden factory. 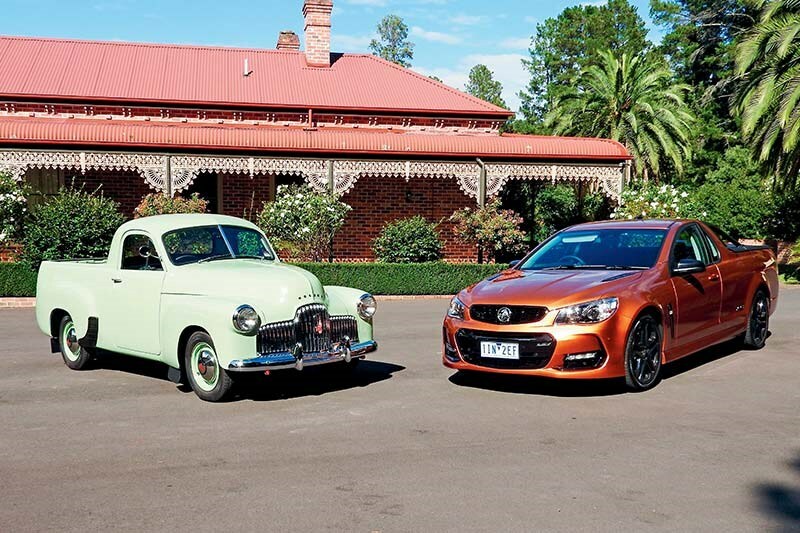 Holden drove its first ute, the 50-216, based on the original 48-215 passenger car, off the production line in January 1951 and is driving out of the factory for the last time this October, in the SS-V Redline ute, the hottest hombre ever to wear a Holden badge. 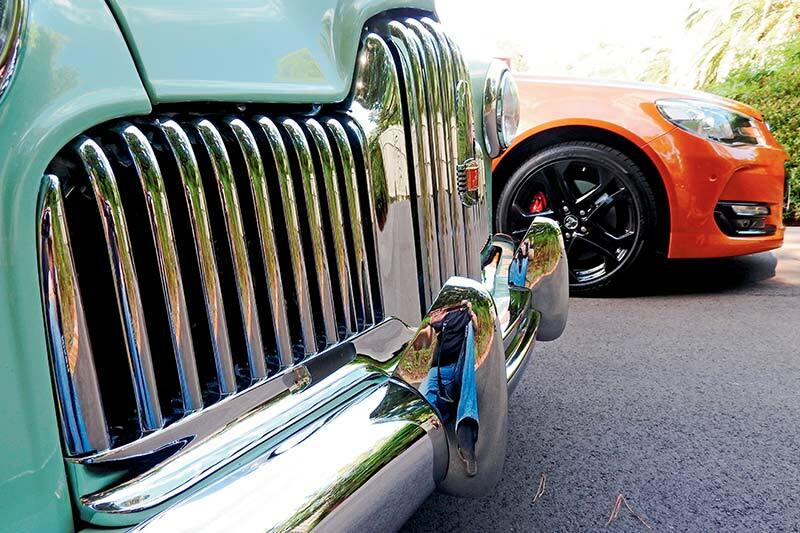 So, let’s take a look at the two and see how the humble workingman’s car has evolved. When you see them together two things strike you. One, how much the young pup dwarfs the old timer. And two, how elegant the chrome makes the 1951 model look and how its elimination makes the SS-V look positively mean. The SS-V Redline stands a shade over five metres long, nearly two metres wide, a tad under 1.5 metres tall and its wheelbase is near as dammit to three metres. The ‘Humpy’ as it was affectionately known for obvious reasons is just 4.3 metres long, 1.7 metres wide, 1.56 metres tall and sits on a 2.6-metre wheelbase. Today’s mechanics would love the simplicity and ease of working on the 2.1-litre straight six and three-speed manual gearbox of the original, which took an agonising 18.7 seconds to reach the legal limit due to its modest 45kW and 135Nm output. Lift the bonnet on the Redline and there’s barely room for a feeler gauge. It’s like wearing a size 8 shoe when you have a size 10 foot, with everything so jammed in. The 6.2-litre V8 that lurks under the big plastic cover packs more punch than Danny Green and belts out 304kW and 570Nm slinging it to 100km/h in 4.9 secs in either six-speed manual or auto form. That said, for all its brawn the SS-V Redline can only carry a measly 630kgs due to its sports underpinnings, not shedloads more than the 355 kilograms of the ’51 model. And while the SS-V Redline’s cargo area looks like a big plastic bin, the timber paneling and metal strips in the back of the ’Olden are a work of art. Underneath the ’Olden shows the simplicity of the short- and long-arm independent coil-spring front end and the rear Hotchkiss drive with semi-elliptic springs and single exhaust outlet. Then there is the worm and sector type steering and 9-inch drum brakes front and back. Peek under the SS-V Redline and you notice the huge Brembo brake calipers and large disc brakes, the slip diff and large exhaust pipes along with the multi-link rear suspension and fat sway bars that are part of the top spec sports suspension. While the ’51 offered no assistance whatsoever, the SS-V Redline gets electronic power-steering to turn the fat, low profile, 8.5-inch-wide, 19inch-diameter alloys. 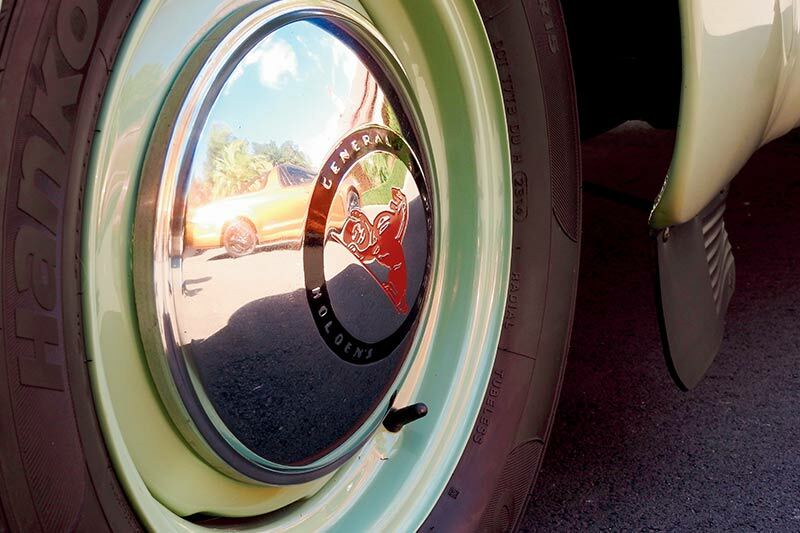 Many of today’s sports motorcycles have fatter tyres that the ’51 ute which wore four-ply tyres on15x5-inch rims. 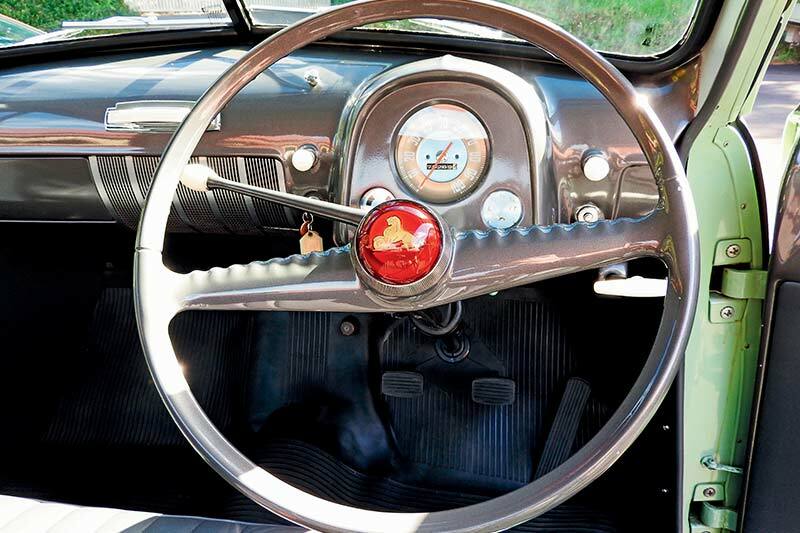 Open the door of the ’51 model and it’s as sparse as a tent, with just a big slippery vinyl bench seat to give you third degree burns or hypothermia, depending on the season. There’s matching vinyl on the floor though and wind up windows and a choke and a huge Bakelite steering wheel with the gear lever poking out one side of the column. There is no radio, no vents, no… Well… Not much of anything really. Visually, the SS-V Redline interior is almost visual overkill after stepping out of the old timer. There is faux carbon, gloss black and chrome trimmings, sports seats and leather steering wheel, paddle shifts, carpet, cup holders, multi-choice air con, power windows and handbrake, USB ports and storage space behind the electrically adjustable and heated seats. It is hardly what you’d call a workhorse. Sitting in the SS-V Redline you are confronted with a multitude of gauges, sensors, an infotainment screen, Bluetooth and even head up display on the windscreen. The ’51 dash looks naked with just a big speedo, small petrol gauge and warning lamps for coolant temp, oil pressure and the generator. Safety features were pretty sparse back in the 50s and the crumple zone usually ended up being the occupants. 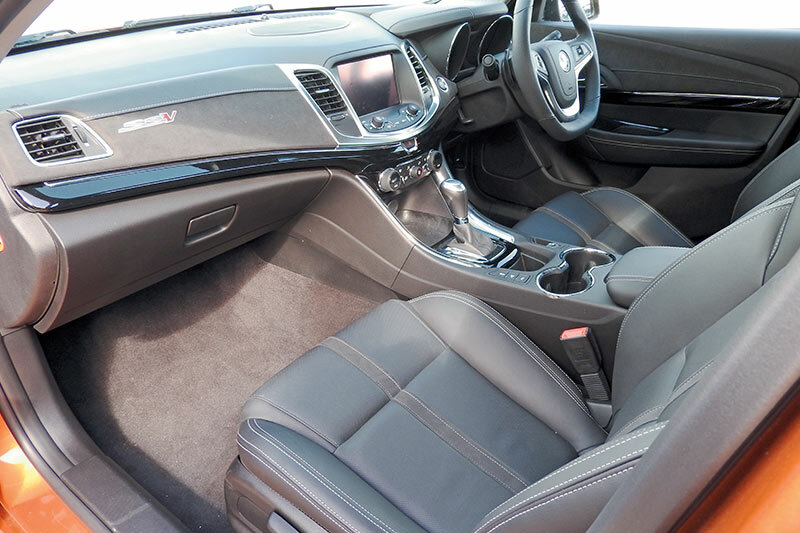 We’ve become a lot more safety savvy and the SS-V Redline has anti-lock brakes with electronic brakeforce and brake assist, traction and stability controls, lane monitoring, adaptive cruise control, blind spot alert, a reversing camera and a swag of airbags. However, after all these years, some things haven’t changed. Both utes are of monocoque construction, both feature a high-mounted central stoplight and to start either the 1951 model or the 2017 model, you push a button. As with the demise of the advanced Concorde in aviation circles, light commercials seem to be heading back to the past– from coupe utilities to cab/chassis pickups. Exactly what they were before a clever young bloke from Geelong gave us our first ‘ute’ way back in 1934. 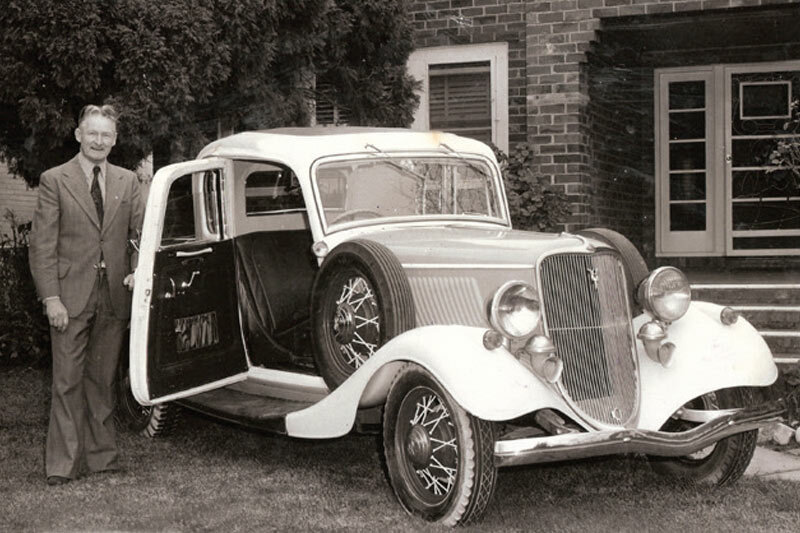 The Aussie ute, originally dubbed a coupé utility, was the brainchild of Lewis Bandt, a young design engineer at Ford’s Geelong factory. Penned in 1933, the same year windscreen wipers became compulsory and the nation’s first traffic lights began operating in Sydney, the utility, like many items of that era, was created out of necessity. Ford received a letter from a Gippsland farmer’s wife which read: "My husband and I can’t afford a car and a truck but we need a car for church on Sunday and a truck to take the pigs to market on Monday. By 1934 Ford had their new utility on the road. The Bandt utility was sent to the USA for display and when he saw it, Henry Ford nicknamed it the "Kangaroo Chaser". When WW II broke out Bandt helped design long-range fuel tanks for Spitfires and Thunderbolt fighter planes. The coupé utility or ute as it became in the vernacular, was just one of several memorable Fords to emanate from the creative talent of Lewis Bandt. He also worked on design innovations for the UK-sourced Ford Zephyr, the never-approved Falcon convertible – of which six were built in 1962 – and the 1967 Australian Ford Fairlane. Before his retirement Bandt worked on the iconic XW, XY and XA Falcons. 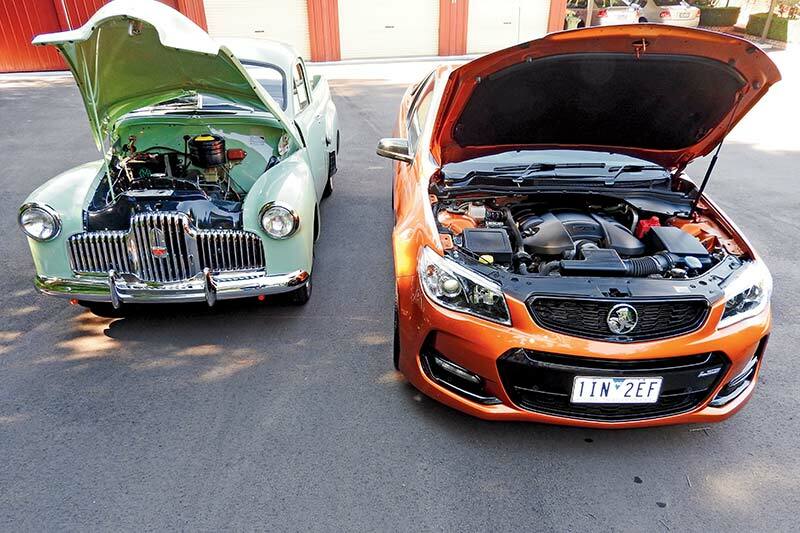 But he will always be remembered as the father of the Australian ute.